While I have a lot of respect for blockbuster action-packed titles, some of my most memorable iOS experiences have been with games that look beyond superficial excitement and focus on the surreal. There's something about affording players the opportunity to participate in an intimate journey with gameplay that focuses on critical thought rather than reflexes that works really well on iOS. Silicon Jelly's Puzzle/Platformer Mimpi [$1.99] is an excellent example of this type of adventure and is a game that everyone needs to play. As we mentioned in our preview, Mimpi follows the tale of an adorably cute dog searching for his master across a wide variety of regions. The platforming aspects are relatively simple and focus on avoiding enemies and hazards in a variety of different ways. While Mimpi on the whole features pacifist gameplay, there are a few "combat" scenarios which weave themselves beautifully into the rest of the gameplay by forcing the player to use the environment to their advantage. Speaking of utilizing the environment, where Mimpi gets interesting is in its puzzle elements, which focus on interacting with the game's surroundings in a variety of different ways. Some puzzles involve memorization, while most of the major ones balance real-world 'obvious' concepts that are integrated in a fantastical setting. Without spoiling the specifics, I can say that Silicon Jelly really did a really good job creating puzzles that most players should be able to understand and solve with a little critical thinking. The fact that Mimpi as a whole doesn't hold the player's hand is another plus which I appreciated. In addition to the puzzles, collectible bones can be found in all the stages, which add to the gameplay while rewarding players with cute illustrations telling the tale of the cute protagonist. Complementing the gameplay in Mimpi is a visual art-style and presentation that I loved. A simple yet colorful palette does a great job bringing Mimpi's world to life. Everything from the protagonist to the enemies to even the environments themselves are teeming with character. Also impressive is the variety of settings that you'll travel with Mimpi across, some of which are just pretty crazy. Meanwhile, a great score ties the whole experience together. 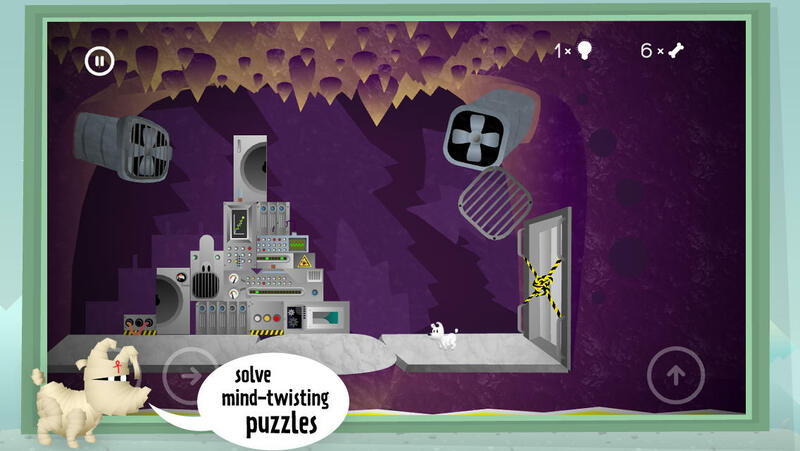 While the puzzles are obviously Mimpi's greatest strength, to some, it can also be its greatest weakness. Some puzzles are reused, although not overtly so meaning that each new stage typically has a new elaborate set-piece to solve. Also littered across the stages are collectible light bulbs which can be used to unlock "hints" for puzzles. Lightbulbs can also be purchased via IAP for those that don't want to take the time to collect them. While it's all obviously optional, purchasable hints as a concept never rubbed me the right way. 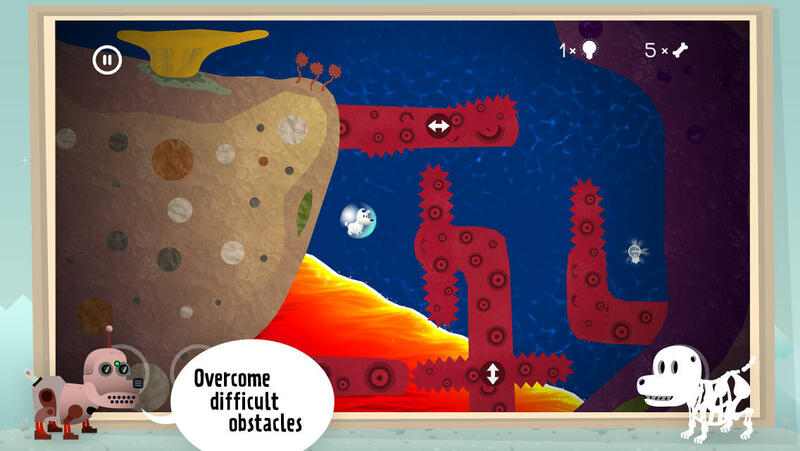 The rest of the IAP is restricted to different costumes for Mimpi, which are purely optional. Regardless, some puzzles can be challenging even with the hints. In these situations, I found the challenge was due primarily because of the actual control mechanics than the challenges themselves. In this regard, players that aren't conditioned for such open-ended puzzles may find themselves frustrated at the lack of assistance even with the hint system. Admittedly, playing through Mimpi did require me to adjust the way I thought about my surroundings while playing the game. However, folks that have played puzzle adventures in the past know that this sort of challenge simply comes with the territory. Mimpi isn't going to wow you with fast-action sequences or elaborate cutscenes, but it's still an awesome experience experience to play through. Mimpi is adorable, the artwork is amazing, and the puzzles are both challenging and simply fun to play through. Silicon Jelly and Crescent Moon have a winner on their hands, and I highly recommend folks check it out.